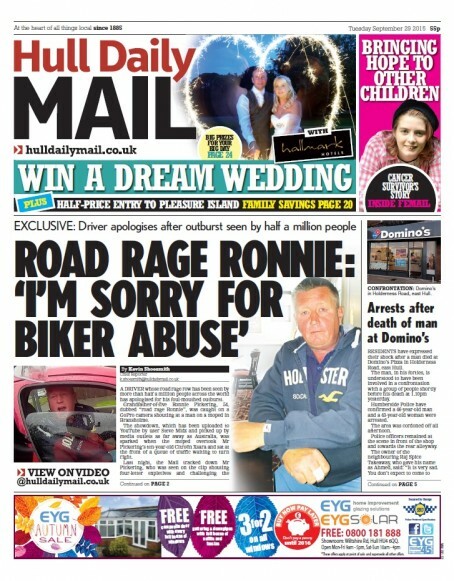 A regional daily scooped the nationals after scoring an exclusive interview with internet ‘road rage’ sensation Ronnie Pickering. The Hull Daily Mail tracked down Mr Pickering, whose rant against a moped rider went viral across the web on Monday morning. The incident, filmed by the anonymous rider with a Go Pro camera, was sparked when Mr Pickering was overtaken by the moped. Mr Pickering asked the man if he knew who he was, shouting his own name three times before challenging him to a “bare knuckle” fight. When the video began to appear across the internet, chief reporter Kevin Shoesmith was despatched to try and find him and eventually persuaded him to talk. The exclusive interview – achieved in the face of competition from national journalists waving chequebooks – provided the Mail with yesterday’s splash, pictured below. Deputy editor Jamie Macaskill told HTFP: “It’s what we still do very well. When we heard about the story in the morning as the world woke up to then name Ronnie Pickering, we got somebody out of the office losing foot leather. “We thought we should find Ronnie to see what his side of the story was, so it was a case of tracking through the area he lives and where the incident happened. “We came upon a relative fairly quickly which led to where we suspected Ronnie might be. On beating other media outlets to the story, Jamie added: “It’s not a case of one-upmanship, it’s a case of doing what we should be doing well. The incident between Ronnie and the rider took place at around 4pm on 21 September. Since going viral on Monday, the original clip has sparked a number of parody videos. Mr Pickering has since apologised for the incident in his interview with the Mail. In his interview with Kevin, who was named News Reporter of the Year at last week’s O2 Media Awards for Yorkshire and the Humber, Mr Pickering called the rider a “muppet” but admitted there had been an “over-reaction” under “extreme provocation”. The paper’s report describes Mr Pickering as “well known” on the Bransholme estate in Hull. Anyone who gives this vile bully the oxygen of publicity should be ashamed of themselves. Maybe get your “clickbait” exercised and see how he’s now enjoying himself on Twitter. Great story, but it’s just a shame it is this muppet who has put the city of ‘Ull on the map for all the wrong reasons! Or has he actually helped promote the city of Hull? However, it must be empathised the majority of people from ‘Ull are not all idiots like Ron ‘Do you know who I am?’ Pickering. It’s good to see people are way of ‘clickbait’ style news now, but this isn’t really clickbait – it is local interest if it happened on their patch. Clickbait is when you write something wholly unconnected to your readership to pull them into your site, something like when is strictly come dancing on? or ‘the fappening’ or similar. Readers are spotting this a mile off now. He’s obviously a horrible twit but fair play to them for tracking him down. I think readers can judge for themselves the kind of man he is from his weasel worded non-apology. Local paper gets interview with local person – well stab me vitals! Of course, the more interesting element of the story is the film itself, which went straight on the internet via Reddit. Old school media left to scrabble around for the follow-ups. Hats off to the HDM with a local paper showing the rest how it’s done. But should I be worried that I had only sort of half heard about something to do with a bloke having a row with someone else because of some bad driving, never realising it was actually a genuine global ‘internet sensation’. I didn’t know any more until I saw it here on HTFP? Sometimes I feel as if life is just passing me by. What a waste of time and effort. Surely they could have cobbled something together using anonymous and unverifiable Twitter quotes from random strangers without leaving the office. Could Ronnie’s ”side of the story ” be that he has a temper problem? Laughing at this PR guff. I checked HDM website the evening it was all over nationals. Not a mention. There’s no point claiming plaudits when the rest of us have moved on from the story. Well it’s still popping up on my Facebook newsfeed so I guess the public is still interested. Well done Kevin for a proper follow up that moves the story on.